Tonight’s dinner led to a funny conversation with the Little Vegan about T.V. dinners (and an interesting internet search so we could show her a picture of the old Swanson dinners.) When I was pregnant with her I worked with a bunch of kids that were commenting on the fact that they had never had a meal that didn’t consist of at least one part that hadn’t been microwaved. For some reason this really freaked me out. I went home and told my hubby and we donated the microwave the next day. Between the lack of a microwave and our dietary choices she has had very little in the way of premade meals and could not wrap her head around our fascination with these little pot pie things. Hubby and I were in love at first bite and he is already looking forward to his leftover pie for lunch tomorrow. 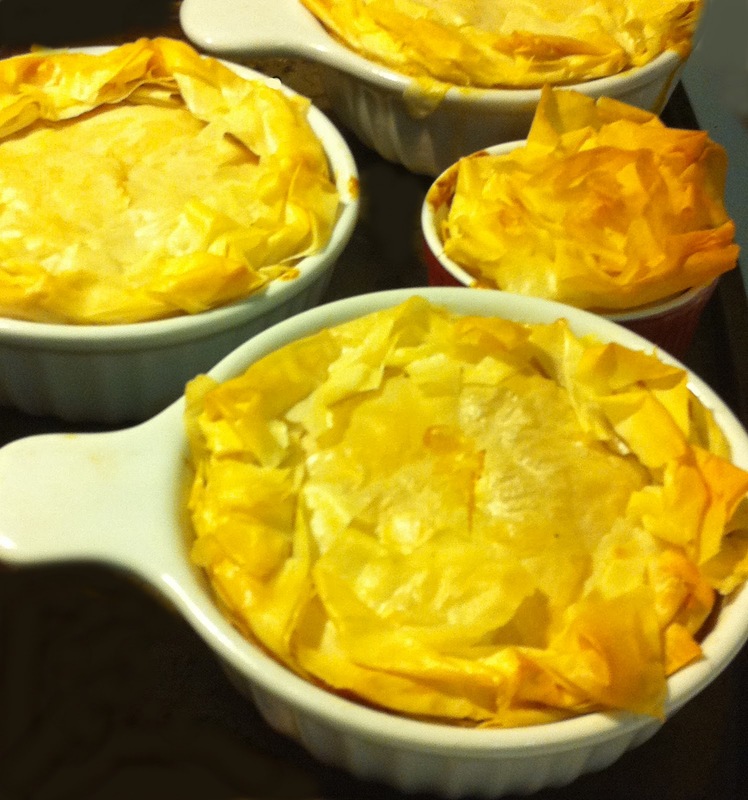 These pot pie’s were covered with Fillo Dough because I had left over from the Not So Traditional Baklava (recipe will be up in a few days if they turn out) but they could easily be covered with Biscuits if you don’t have Fillo readily available. If you opt for biscuits, mold them the size of the bowl you are covering and cook the same as directions below. This is the first time I have played with Fillo and I watched quite a few videos and read a lot of techniques because I was nervous about the unknown. They are very delicate and you need to keep them moist with a wet towel over the top because they are unusable once dried out. The recipe below will make 4 personal sized Pot Pie’s. Preheat oven to 375 degrees. In a skillet saute shallot, garlic, sweet potato and carrots in olive oil over medium heat for 15 minutes. Add 1/3 cup water. Cook until water has evaporated. Mix in chick n less strips, bell pepper, artichoke, peas, and sage. Saute for another 5 minutes. Mix in flour. Slowly stir in water and Braggs and let cook 5 more minutes. While cooking mix cashew cream with nutritional yeast, miso, tomato paste, and vinegar. Stir in cashew mixture. Spoon into 4 oven safe bowls. Cut Fillo into 4 equal rectangles, so you have 16 total. You will use 4 rectangles per pie. Lay one rectangle over bowl, brush with melted butter, and continue with remain 3 rectangles covering top with Earth Balance. Fold edges over so it makes like a pie crust and brush this part with Earth Balance also. Cut a slit in center through all Fillo. To make it easier I put all bowls on a cookie sheet. Bake until top is golden about 45 minutes. Let sit a few minutes to cool and serve. Gallery | This entry was posted in Gardein, Main Course. Bookmark the permalink.